Farm Sanctuary is the nation's leading farm animal protection organization. Since incorporating in 1986, Farm Sanctuary has worked to expose and stop cruel practices of the "food animal" industry through research and investigations, legal and institutional reforms, public awareness projects, youth education, and direct rescue and refuge efforts. Farm Sanctuary shelters in Watkins Glen, N.Y., and Orland, Calif., provide lifelong care for hundreds of rescued animals, who have become ambassadors for farm animals everywhere by educating visitors about the realities of factory farming. Additional information can be found at farmsanctuary.org or by calling 607-583-2225. Making Hay with Gene Baur features personal blogs from Farm Sanctuary President & Co-founder Gene Baur, as well as other entries focused on Farm Sanctuary’s advocacy efforts and the multiple ways that you can get involved and make a difference for farm animals. Gene Baur has been hailed as “the conscience of the food movement” by TIME magazine. For 25 years he has traveled extensively, campaigning to raise awareness about the abuses of industrialized factory farming and our cheap food system. A pioneer in the field of undercover investigations, Gene has visited hundreds of farms, stockyards and slaughterhouses documenting the deplorable conditions that exist. His pictures and videos exposing factory farming cruelties have aired nationally and internationally, educating millions about the plight of modern farmed animals. Gene has also testified in courts and before local, state and federal legislative bodies, advocating for better conditions for farm animals. His most important achievements include winning the first-ever cruelty conviction at a U.S. stockyard and introducing the first U.S. laws to prohibit cruel farming confinement methods in Florida, Arizona and California. His efforts have been covered by top news organizations, including the New York Times, Los Angeles Times, Chicago Tribune and Wall Street Journal. In 2008, Gene’s book, Farm Sanctuary: Changing Hearts and Minds About Animals and Food, became a national best seller. As a recent guest on The Martha Stewart Show’s first-ever “vegan show,” he inspired viewers to eat in alignment with their compassionate values. Gene began his activist career selling veggie hot dogs out of a VW van at Grateful Dead concerts to fund farm animal rescues. Today, he serves as President of Farm Sanctuary, the nation’s leading farm animal protection organization, with shelters in New York and California. Providing rescue, refuge and adoption for hundreds of farm animals each year, Farm Sanctuary shelters enable visitors to connect with farm animals as emotional, intelligent individuals. Gene believes these animals stand as ambassadors for the billions on factory farms who have no voice, and he has dedicated his career to advocating on their behalf. Gene holds a bachelor’s degree in sociology from California State University Northridge and a master’s degree in agricultural economics from Cornell University. Allan E. Kornberg, M.D. is Executive Director of Farm Sanctuary. A lifelong animal advocate, Dr. Kornberg formerly served as the U.S. Executive Director of the World Society for the Protection of Animals, and has worked with numerous other advocacy groups, including the Physicians Committee for Responsible Medicine, to end the abuses of animals in factory farms and laboratories. He has also had a distinguished career as a pediatrician with more than 25 years of clinical and executive experience, having served as Senior Vice President for the National Initiative for Children's Health Quality, CEO of Network Health, Medical Director of Harvard Pilgrim Health Care, Executive Director and Medical Director for the physician-hospital organization at Scottish Rite Children's Medical Center, and Chief of Emergency Medicine at Buffalo Children's Hospital. Dr. Kornberg earned his undergraduate degree from MIT, a medical degree from Mt. Sinai School of Medicine, and an M.B.A. from the University of Rochester. 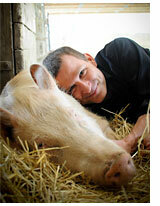 Bruce Friedrich is senior director for strategic initiatives at Farm Sanctuary. Bruce, who has been a progressive activist for 25 years, worked for two years as a public school teacher in inner city Baltimore (where he was his school’s “teacher of the year”), for six years at a homeless shelter and soup kitchen in Washington, D.C., and for 15 years at PETA, where he was vice president for policy. Bruce co-authored The Animal Activist's Handbook with Matt Ball. About the book, Peter Singer states, "Rarely have so few pages contained so much intelligence and good advice. Get it, read it, and act on it. Now." Michelle Waffner has been with Farm Sanctuary for 10 years and currently works as Farm Sanctuary's education director, based at the Watkins Glen, N.Y. sanctuary. In addition to managing the education department, Michelle oversees the Veg for Life Campaign, on-shelter events, and the internship and visitor programs at both sanctuaries. She holds a bachelor's degree in biology from Binghamton University. When she isn't applying her skills on the farm, Michelle volunteers at Ithaca Children's Garden.